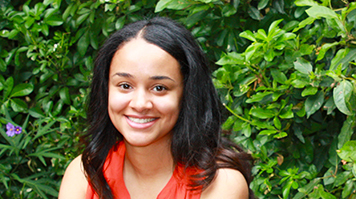 For first-year psychology student Sade Hamilton, going to university in London wasn't the original plan, but Clearing brought her a different perspective. "I was applying to universities outside of London with higher educational diplomas and GCSEs, rather than A Levels, and when I got my results my qualifications weren't accepted by my first university choices. When it became clear that I needed to enter Clearing, I initially thought that it was the worst possible outcome to happen. I did not want to go through it, but I'm very pleased that I did." Sade's sixth-form college had a partnership arrangement with London South Bank University, and Sade was confident that her qualifications would be accepted. She was already familiar with the university's courses, and phoned LSBU's clearing hotline to discuss putting in an application for the BSc (Hons) Psychology course. "I chose to study psychology because it's just such an interesting subject. I wanted to learn more about others and about myself, and would like to study for a Masters in Forensic Psychology after graduation." "When applying through clearing, the deadlines and quick changes in circumstances can be difficult to keep up with, but the person I spoke to at LSBU was very helpful and had a reassuring voice." Sade's application was swiftly accepted and she hasn't looked back since. "I have been at LSBU for a year now, and with hindsight wouldn't have chosen any differently. Whilst at college, I was diagnosed with having dyslexia. I was concerned about what support I would be able to receive at university, but LSBU has been brilliant about helping me. Staff in the student advice centre were so helpful and provided lots of information about what support was available for students with learning difficulties – all I needed to do was ask." Sade has made the most of her first-year course at LSBU and by attending events organised by the Psychology Society has been able to delve deeper into her subject area. "The Psychology Society events are a great chance to meet with other psychology students and our teachers, outside of lectures. It's particularly nice to have gotten to know the teachers a little better, as I now feel so much more comfortable asking questions in class. "The whole experience at LSBU has been wonderful, the support, sense of community and food at the university are fantastic and now that I'm here I wouldn't change my choice of university for the world."